Manila, June 3, 2014 - Sofitel Philippine Plaza announces the revival of the Sofitel Manila Half Marathon, last staged in 2008. 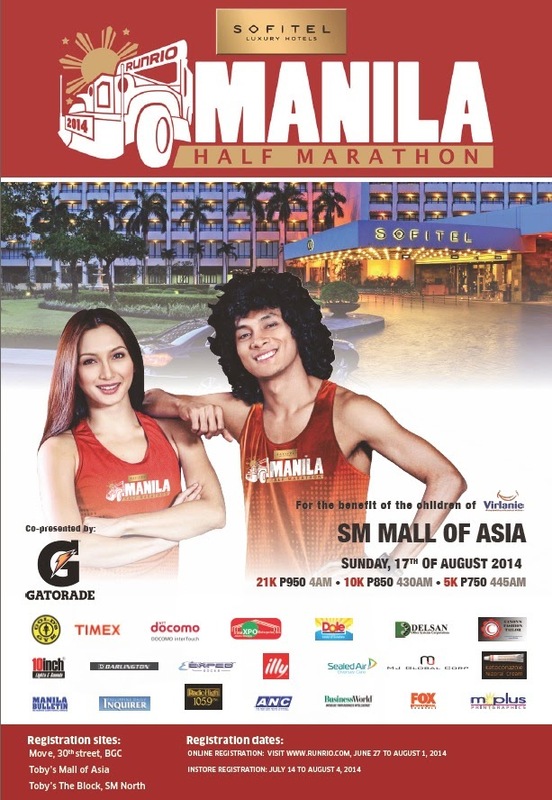 The Sofitel Manila Half Marathon 2014 will feature 5k, 10k and 21k categories, and will be held at the Mall of Asia grounds. Cash prizes and luxury prizes from Sofitel are at stake for the top three male and female winners of category. “The Sofitel Manila Half Marathon aims to be at par with other international marathons such as the Boston Marathon or Singapore Marathon. Aside from this, the greater aim of the event is to contribute to the upliftment of the lives of the street children of Manila through Virlanie Foundation, the beneficiary of the marathon. In the last year, we have raised over Php 1. 5 million through the two runs we have organized – a part of the proceeds had been used to purchase a van that was handed over to the foundation for their activities. This year we are targeting to have over 6,000 runners and for better success in terms of fund raising. ” says Sofitel Philippine Plaza General Manager Adam Laker. The Sofitel Manila Half Marathon is a collaboration between the Sofitel Philippine Plaza and the premier running event organizer in the country, Runrio, led by Coach Rio de la Cruz. “By organizing the Sofitel Manila Half Marathon, we hope to one day become one of the world's most popular running event attracting both amateur and professional runners from all over the world to compete in Manila. This marathon is dedicated to the children of Virlanie Foundation with the objective of contributing to a better future for the children of Manila.” says Coach Rio de la Cruz. The marathon takes the runners through a panoramic view of the Manila Bay while running with the cool breeze of the bay. Sofitel Manila Half Marathon 2014 follows the two highly successful running events brought about by the Sofitel-Runrio partnership in 2013: The Sofitel Runrio Battle of the Sexes Leg 1 and 2. Just like the two Battle of the Sexes events, the Manila Half Marathon shall be a green race. Runners are highly encouraged to bring their own water bottles for refilling at hydration stations, instead of using paper and plastic cups. Registration fees are as follows: P750 for the 5k, P850 for the 10k, and P950 for the 21k. All runners shall receive a race bib, singlet, and finishers lootbag and drinks. The 21km category shall also receive a finishers medal and finishers shirt. This event is co-presented by Gatorade and sponsored by the following: Gold’s Gym, DOCOMO, StarXpo, DOLE, Delsan Office Systems,Canon Fashion Tailoring,10 Inch Lights and sounds, Dowi Hosiery, Delizio Fine Foods, Diversey, MJ Global, M Plus, Timex, Premier water and Nizoral. Media partners include ANC, Business World, Fox International Channels, Manila Bulletin, Philippine Daily Inquirer and Radio High.